My officially official stance on Cole Hamels has always been (well, since the prospect of trading him became an actual thing) that Ruben Amaro, Jr. is wisely taking a calculated risk by holding onto his ace until receiving the offer that he’s looking for. Opposing teams are trying to push the embattled GM around in the media by floating the idea that his demands are outrageous, but you know what? Cole Hamels is really good at baseball, and I wouldn’t want to get shorted when parting ways with him, either. I understand the notion that teams want to wait until closer to the deadline to see how they stack up in the pennant races, but if you really want Hamels, LEGGOOOOOOOOO. Amaro is on record saying that the Phillies are willing to pay some of Hamels’ deal if the return is right, and even then, three years and $70.5 million after this season (with a vesting option for 2019) is a reasonable contract for someone of Hamels’ age and skill set. But for those teams that are still “waiting and seeing” on Hamels, I decided to create a chart they can follow after every start. It’s entirely from their perspective, because “he’s clearly going to help you” was as painfully obvious in January as it is now. 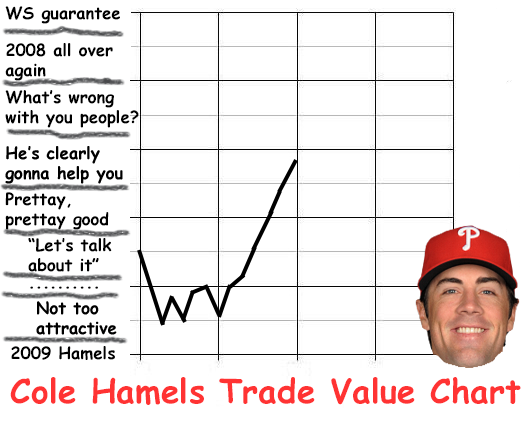 Like most years, Hamels started slow in April. Like most years, he’s been excellent since that point. Like most years, we shouldn’t be surprised about any of this. Besides the two mistakes, the many opposing scouts in attendance had to be impressed with what they saw. Hamels only allowed four other baserunners in eight innings of two-run ball, striking out nine in the process. In each of his last five starts, Hamels has lasted at least seven innings and surrendered no more than two runs. He good. Even though Hamels was cruising, it was an interesting decision by Ryne Sandberg to leave him in for the eighth inning when he was already over 100 pitches. The 2008 World Series MVP worked a 1-2-3 eighth but finished the night with 117 pitches because of a couple of strikeouts in the eight inning. From a game strategy standpoint, it’s hard to have any qualms with Sandberg’s decision. He was correct about how Hamels worked an easy inning. I’m just unsure why a team who won’t play a meaningful game all season is pushing its major trade chip and player most important to their rebuilding process so hard. Sure, there’s not a lot of bullpen arms you can trust, but that doesn’t matter in the big picture. Hamels staying healthy does. The Phillies had started to hit a few balls hard against Chad Bettis, so it’s ironic that a nubber off the end of the bat broke up the no-hit bid in the eighth inning. In basketball or football, it’s called “taking what the defense gives you.” The hit didn’t look like much, but it’s all Asche was attempting to do. The Phillies’ offensive futility against Bettis ruined Asche’s return to the big leagues. When they ran out onto the field, he headed in the general direction he was used to… and then kept on going until he made it to the outfield. On the night, Asche didn’t have many balls hit his in direction so there will be no critique of his ability to man left field. He did admit he was a little nervous to begin, though. “I was a little jittery maybe the first hitter or so and got some sweat going and some ball hit into the air that I could see, it’s just baseball,” he said. Quick aside: To make room for Asche, Grady Sizemore was designated for assignment. Sandberg praised his professionalism at length before the game. Only two weeks ago, Sizemore had nine hits in only a handful of games and was one of the Phillies' best hitters. Still, he probably doesn't have a future in Philly, so this decision made sense. SS @jp_crawford has been promoted to @ReadingFightins. The kid’s emoji game is on point, as well. Crawford went 2-5 at the plate in Clearwater’s 7-6 victory over Fort Myers, which raised his average for the season up to a cool .392. As long as Aaron Nola is still in Double-A, Reading becomes far and away the must-see team in the Phillies’ system with a wealth of starting pitching and Crawford joining forces with Roman Quinn at the top of the order.